Host-associated bacteria can have both beneficial and detrimental effects on host health. While some of the molecular mechanisms that determine these outcomes are known, little is known about the evolutionary histories of pathogenic or mutualistic lifestyles. 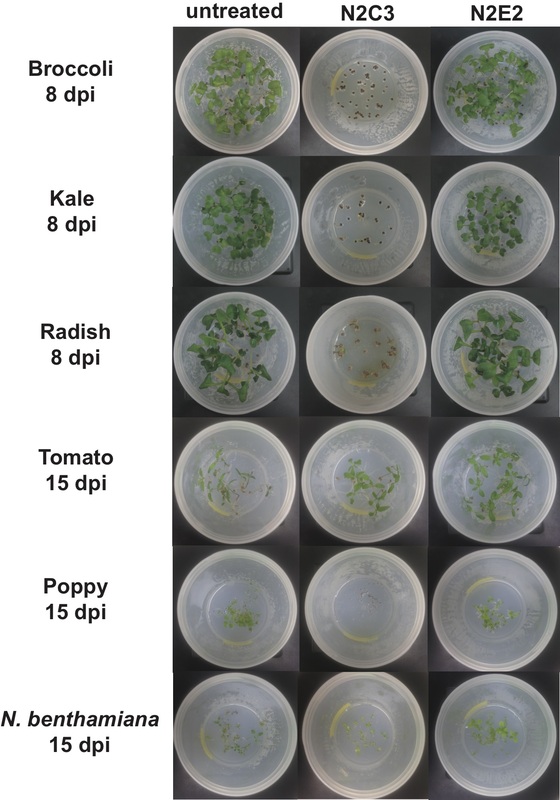 Using the model plant Arabidopsis, we found that closely related strains within the Pseudomonas fluorescens species complex promote plant growth and occasionally cause disease. To elucidate the genetic basis of the transition between commensalism and pathogenesis, we developed a computational pipeline and identified genomic islands that correlate with outcomes for plant health. One island containing genes for lipopeptide biosynthesis and quorum-sensing is required for pathogenesis. Conservation of the quorum-sensing machinery in this island allows pathogenic strains to eavesdrop on quorum signals in the environment and coordinate pathogenic behavior. We found that genomic loci associated with both pathogenic and commensal lifestyles were convergently gained and lost in multiple lineages through homologous recombination, possibly constituting an early step in the differentiation of pathogenic and commensal lifestyles. Collectively this work provides novel insights into the evolution of commensal and pathogenic lifestyles within a single clade of host-associated bacteria. Hirsch A. Plant-microbe symbioses: a continuum from commensalism to parasitism. Symbiosis. 2004;37:345–63. Xin X-F, Kvitko B, He SY. Pseudomonas syringae: what it takes to be a pathogen. Nat Rev Microbiol. 2018;16:316. Jones KM, Kobayashi H, Davies BW, Taga ME, Walker GC. How rhizobial symbionts invade plants: the Sinorhizobium - Medicago model. Nat Rev Microbiol. 2007;5:619–33. Savory EA, Fuller SL, Weisberg AJ, Thomas WJ, Gordon MI, Stevens DM, et al. Evolutionary transitions between beneficial and phytopathogenic Rhodococcus challenge disease management. eLife. 2017;6:1–28. Tenaillon O, Skurnik D, Picard B, Denamur E. The population genetics of commensal Escherichia coli. Nat Rev Microbiol. 2010;8:207–17. Lin D, Koskella B. Friend and foe: factors influencing the movement of the bacterium Helicobacter pylori along the parasitism-mutualism continuum. Evol Appl. 2015;8:9–22. Quibod IL, Grande G, Oreiro EG, Borja FN, Dossa GS, Mauleon R, et al. Rice-infecting Pseudomonas genomes are highly accessorized and harbor multiple putative virulence mechanisms to Cause Sheath Brown Rot. PLoS ONE. 2015;10:1–25. Trantas EA, Licciardello G, Almeida NF, Witek K, Strano CP, Duxbury Z, et al. Comparative genomic analysis of multiple strains of two unusual plant pathogens: Pseudomonas corrugata and Pseudomonas mediterranea. Front Microbiol. 2015;6:1–19. Fromin N, Achouak W, Thiéry JM, Heulin T. The genotypic diversity of Pseudomonas brassicacearum populations isolated from roots of Arabidopsis thaliana: influence of plant genotype. FEMS Microbiol Ecol. 2001;37:21–9. Berendsen RL, van Verk MC, Stringlis IA, Zamioudis C, Tommassen J, Pieterse CMJ, et al. Unearthing the genomes of plant-beneficial Pseudomonas model strains WCS358, WCS374 and WCS417. BMC Genomics. 2015;16:1–23. Sikorski J, Jahr H, Wackernagel W. The structure of a local population of phytopathogenic Pseudomonas brassicacearum from agricultural soil indicates development under purifying selection pressure. Environ Microbiol. 2001;3:176–86. Belimov A, Dodd I, Safronova V, Hontzeas N, Davies W. Pseudomonas brassicacearum strain Am3 containing 1-aminocyclopropane-1-carboxylate deaminase can show both pathogenic and growth-promoting properties in its interaction with tomato. J Exp Bot. 2007;58:1485–95. Bulgarelli D, Rott M, Schlaeppi K, Ver Loren van Themaat E, Ahmadinejad N, Assenza F, et al. Revealing structure and assembly cues for Arabidopsis root-inhabiting bacterial microbiota. Nature. 2012;488:91–5. Haney CH, Wiesmann CL, Shapiro LR, Melnyk RA, O’Sullivan LR, Khorasani S, et al. Rhizosphere-associated Pseudomonas induce systemic resistance to herbivores at the cost of susceptibility to bacterial pathogens. Mol Ecol. 2018;27:1833–47. Scarlett CM, Fletcher JT, Roberts P, Lelliott RA. Tomato pith necrosis caused by Pseudomonas corrugata n. sp. Ann Appl Biol. 1978;88:105–14. Kim J, Choi O, Kim W-I. First report of sheath brown rot of rice caused by Pseudomonas fuscovaginae in Korea. Plant Dis. 2015;99:1033. Mcclean KH, Winson MK, Fish L, Taylor A, Chhabra SR, Camara M, et al. Quorum sensing and Chromobacteriurn violaceum: exploitation of violacein production and inhibition for the detection of N-acyl homoserine lactones. Microbiology. 1997;143:3703–11. Latifi A, Winson MK, Foglino M, Bycroft BW, Stewart GSAB, Lazdunski A, et al. Multiple homologues of LuxR and LuxI control expression of virulence determinants and secondary metabolites through quorum sensing in Pseudomonas aeruginosa PAO1. Mol Microbiol. 1995;17:333–43. Joshi C, Patel P, Singh A, Sukhadiya J, Shah V. Frequency-dependent response of Chromobacterium violaceum to sonic stimulation and altered gene expression associated with enhanced violacein production at 300 Hz. Curr Sci. 2018;115:83–90. Hmelo LR, Borlee BR, Almblad H, Love ME, Randall TE, Tseng BS, et al. Precision-engineering the Pseudomonas aeruginosa genome with two-step allelic exchange. Nat Protoc. 2015;10:1820–41. Rietsch A, Vallet-Gely I, Dove SL, Mekalanos JJ. ExsE, a secreted regulator of type III secretion genes in Pseudomonas aeruginosa. Proc Natl Acad Sci USA. 2005;102:8006–11. Geels FP, Schippers B. Selection of antagonistic fluorescent Pseudomonas spp. and their root colonization and persistence following treatment of seed potatoes. J Phytopathol. 1983;108:193–206. De Weert S, Dekkers LC, Kuiper I, Bloemberg GV, Lugtenberg BJJ. Generation of enhanced competitive root-tip-colonizing Pseudomonas bacteria through accelerated evolution. J Bacteriol. 2004;186:3153–9. Kamilova F, Lamers G, Lugtenberg B. Biocontrol strain Pseudomonas fluorescens WCS365 inhibits germination of Fusarium oxysporum spores in tomato root exudate as well as subsequent formation of new spores. Environ Microbiol. 2008;10:2455–61. Achouak W, Sutra L, Heulin T, Meyer JM, Fromin N, Degraeve S, et al. Pseudomonas brassicacearum sp. nov. and Pseudomonas thivervalensis sp. nov., two root-associated bacteria isolated from Brassica napus and Arabidopsis thaliana. Int J Syst Evol Microbiol. 2000;50:9–18. Thorgersen MP, Lancaster WA, Vaccaro BJ, Poole FL, Rocha AM, Mehlhorn T, et al. Molybdenum availability is key to nitrate removal in contaminated groundwater environments. Appl Environ Microbiol. 2015;81:4976–83. Price MN, Wetmore KM, Waters RJ, Callaghan M, Ray J, Liu H, et al. Mutant phenotypes for thousands of bacterial genes of unknown function. Nature. 2018;557:503–9. Hesse C, Schulz F, Bull CT, Shaffer BT, Yan Q, Shapiro N, et al. Genome-based evolutionary history of Pseudomonas spp. Environ Microbiol. 2018;20:2142–59. Emms DM, Kelly S. OrthoFinder: solving fundamental biases in whole genome comparisons dramatically improves orthogroup inference accuracy. Genome Biol. 2015;16:1–14. Emms DM, Kelly S. OrthoFinder2: fast and accurate phylogenomic orthology analysis from gene sequences. bioRxiv. 2018;466201. Papenfort K, Bassler BL. Quorum sensing signal-response systems in Gram-negative bacteria. Nat Rev Microbiol. 2016;14:576–88. Scholz-Schroeder BK, Hutchison ML, Grgurina I, Gross DC. The contribution of syringopeptin and syringomycin to virulence of Pseudomonas syringae pv. syringae strain B301D on the basis of sypA and syrB1 biosynthesis mutant analysis. Mol Plant Microbe Interact. 2001;14:336–48. Hutchison ML, Gross DC. Lipopeptide phytotoxins produced by Pseudomonas syringae pv. syringae: comparison of the biosurfactant and ion channel-forming activities of syringopeptin and syringomycin. Mol Plant Microbe Interact. 1997;10:347–54. Baltrus DA, Nishimura MT, Romanchuk A, Chang JH, Mukhtar MS, Cherkis K, et al. Dynamic evolution of pathogenicity revealed by sequencing and comparative genomics of 19 Pseudomonas syringae isolates. PLoS Pathog. 2011;7:e1002132. Hockett KL, Nishimura MT, Karlsrud E, Dougherty K, Baltrus DA. Pseudomonas syringae CC1557: a highly virulent strain with an unusually small type III effector repertoire that includes a novel effector. Mol Plant Microbe Interact. 2014;27:923–32. Strano CP, Bella P, Licciardello G, Fiore A, Lo Piero AR, Fogliano V, et al. Pseudomonas corrugata crpCDE is part of the cyclic lipopeptide corpeptin biosynthetic gene cluster and is involved in bacterial virulence in tomato and in hypersensitive response in Nicotiana benthamiana. Mol Plant Pathol. 2015;16:495–506. Patel HK, Matiuzzo M, Bertani I, De Paul Bigirimana V, Ash GJ, Höfte M, et al. Identification of virulence associated loci in the emerging broad host range plant pathogen Pseudomonas fuscovaginae. BMC Microbiol. 2014;14:1–13. Licciardello G, Strano CP, Bertani I, Bella P, Fiore A, Fogliano V, et al. N-acyl-homoserine-lactone quorum sensing in tomato phytopathogenic Pseudomonas spp. is involved in the regulation of lipodepsipeptide production. J Biotechnol. 2012;159:274–82. Licciardello G, Bertani I, Steindler L, Bella P, Venturi V, Catara V. Pseudomonas corrugata contains a conserved N-acyl homoserine lactone quorum sensing system; its role in tomato pathogenicity and tobacco hypersensitivity response. FEMS Microbiol Ecol. 2007;61:222–34. Berry C, Fernando WGD, Loewen PC, de Kievit TR. Lipopeptides are essential for Pseudomonas sp. DF41 biocontrol of Sclerotinia sclerotiorum. Biol Control. 2010;55:211–8. Michelsen CF, Watrous J, Glaring MA, Kersten R, Koyama N, Dorrestein PC. Nonribosomal peptides, key biocontrol components for Pseudomonas fluorescens In5, isolated from a greenlandic suppressive soil. mBio. 2015;6:1–9. Berry CL, Nandi M, Manuel J, Brassinga AKC, Fernando WGD, Loewen PC, et al. Characterization of the Pseudomonas sp. DF41 quorum sensing locus and its role in fungal antagonism. Biol Control. 2014;69:82–9. Garrido-Sanz D, Meier-Kolthoff JP, Göker M, Martín M, Rivilla R, Redondo-Nieto M. Genomic and genetic diversity within the Pseudomonas fluorescens complex. PLoS ONE. 2016;11:e0150183. Collins C, Didelot X. A phylogenetic method to perform genome-wide association studies in microbes that accounts for population structure and recombination. PLoS Comput Biol. 2018;14:1–21. Krause A, Doerfel A, Göttfert M. Mutational and transcriptional analysis of the type III secretion system of Bradyrhizobium japonicum. Mol Plant Microbe Interact. 2002;15:1228–35. Mavrodi DV, Joe A, Mavrodi OV, Hassan KA, Weller DM, Paulsen IT, et al. Structural and functional analysis of the type III secretion system from Pseudomonas fluorescens Q8r1-96. J Bacteriol. 2011;193:177–89. Marchi M, Boutin M, Gazengel K, Rispe C, Gauthier J-P, Guillerm-Erckelboudt A-Y, et al. Genomic analysis of the biocontrol strain Pseudomonas fluorescens Pf29Arp with evidence of T3SS and T6SS gene expression on plant roots. Environ Microbiol Rep. 2013;5:393–403. Munkvold KR, Russell AB, Kvitko BH, Collmer A. Pseudomonas syringae pv. tomato DC3000 type III effector HopAA1-1 functions redundantly with chlorosis-promoting factor PSPTO4723 to produce bacterial speck lesions in host tomato. Mol Plant Microbe Interact. 2009;22:1341–55. Weller DM, Landa BB, Mavrodi OV, Schroeder KL, De La Fuente L, Blouin Bankhead S, et al. Role of 2,4-diacetylphloroglucinol-producing fluorescent Pseudomonas spp. in the defense of plant roots. Plant Biol. 2007;9:4–20. Clark IC, Melnyk RA, Engelbrektson A, Coates JD. Structure and evolution of chlorate reduction composite transposons. mBio. 2013;4:e00379–13. Melnyk RA, Coates JD. The perchlorate reduction genomic island: mechanisms and pathways of evolution by horizontal gene transfer. BMC Genomics. 2015;16:862. Cui Y, Yang X, Didelot X, Guo C, Li D, Yan Y, et al. Epidemic clones, oceanic gene pools, and eco-LD in the free living marine pathogen Vibrio parahaemolyticus. Mol Biol Evol. 2015;32:1396–410. Juhas M, Van Der Meer JR, Gaillard M, Harding RM, Hood DW, Crook DW. Genomic islands: tools of bacterial horizontal gene transfer and evolution. FEMS Microbiol Rev. 2009;33:376–93. Whiteley M, Diggle SP, Greenberg EP. Progress in and promise of bacterial quorum sensing research. Nature. 2017;551:313–20. Hennessy RC, Phippen CBW, Nielsen KF, Olsson S, Stougaard P. Biosynthesis of the antimicrobial cyclic lipopeptides nunamycin and nunapeptin by Pseudomonas fluorescens strain In5 is regulated by the LuxR-type transcriptional regulator NunF. MicrobiologyOpen. 2017;6:1–14. Licciardello G, Caruso A, Bella P, Gheleri R, Strano CP, Anzalone A, et al. The LuxR regulators PcoR and RfiA co-regulate antimicrobial peptide and alginate production in Pseudomonas corrugata. Front Microbiol. 2018;9:521. Wiedenbeck J, Cohan FM. Origins of bacterial diversity through horizontal genetic transfer and adaptation to new ecological niches. FEMS Microbiol Rev. 2011;35:957–76. We thank Dr. Clay Fuqua for providing the Chromobacterium violaceum CV026 biosensor strain, Dr. Teresa de Kievit and Dr. Ricardo Oliva for providing Pseudomonas isolates, and Dr. Adam Steinbrenner and Dr. Justin Meyer for critical reading of the manuscript. RAM is a Simons Foundation Fellow of the Life Sciences Research Foundation. This work was also supported by an NSERC Discovery Grant (NSERC-RGPIN-2016-04121), Canada Foundation for Innovation, and Canada Research Chair grants awarded to CHH, and an NSERC USRA to SSH. The computational research was carried out with support provided by WestGrid and Compute Canada. RAM and CHH designed research and discussed results. RAM and SSH performed experiments. RAM wrote code and performed all bioinformatics analyses. RAM wrote the manuscript with input from CHH and SSH. Correspondence to Cara H. Haney.